"Strengthen Our Common Hope in God in the Midst of an Increasingly Secularized Society"
BERLIN, SEPT. 22, 2011 (Zenit.org).- Here is a Vatican translation of the address Benedict XVI delivered on September 22, 2011 to a gathering of representatives of the Jewish community at Berlin's Reichstag Building. On my visit to the Synagogue in Cologne six years ago, Rabbi Teitelbaum spoke of remembrance as one of the supporting pillars that are needed if a future of peace is to be built. And today I find myself in a central place of remembrance, the appalling remembrance that it was from here that the Shoah, the annihilation of our Jewish fellow citizens in Europe, was planned and organized. Before the Nazi terror, there were about half a million Jews living in Germany, and they formed a stable component of German society. After the Second World War, Germany was considered the "Land of the Shoah" where, for a Jew, it had become virtually impossible to live. Initially there were hardly any efforts to re-establish the old Jewish communities, even though Jewish individuals and families were constantly arriving from the East. Many of them wanted to emigrate and build a new life, especially in the United States or Israel. In this place, remembrance must also be made of the Kristallnacht that took place from 9 to 10 November 1938. Only a few could see the full extent of this act of contempt for humanity, like the Berlin Cathedral Provost, Bernhard Lichtenberg, who cried out from the pulpit of Saint Hedwig's Cathedral: "Outside, the Temple is burning – that too is the house of God". The Nazi reign of terror was based on a racist myth, part of which was the rejection of the God of Abraham, Isaac and Jacob, the God of Jesus Christ and of all who believe in him. The supposedly "almighty" Adolf Hitler was a pagan idol, who wanted to take the place of the biblical God, the Creator and Father of all men. Refusal to heed this one God always makes people heedless of human dignity as well. What man is capable of when he rejects God, and what the face of a people can look like when it denies this God, the terrible images from the concentration camps at the end of the war showed. I would also like to express my gratitude for the deepening dialogue between the Catholic Church and Judaism. The Church feels a great closeness to the Jewish people. With the Declaration Nostra Aetate of the Second Vatican Council, an "irrevocable commitment to pursue the path of dialogue, fraternity and friendship" was made (cf. Address in the Synagogue in Rome, 17 January 2010). This is true of the Catholic Church as a whole, in which Blessed John Paul II committed himself to this new path with particular zeal. Naturally it is also true of the Catholic Church in Germany, which is conscious of its particular responsibility in this regard. In the public domain, special mention should be made of the "Week of Fraternity", organized each year during the first week of March by local Societies for Christian-Jewish Partnership. On the Catholic side there are also annual meetings between bishops and rabbis as well as structured conversations with the Central Council of Jews. Back in the 1970s, the Central Committee of German Catholics (ZdK) took the initiative of establishing a "Jews and Christians" forum, which over the years has issued many well-written and helpful documents. 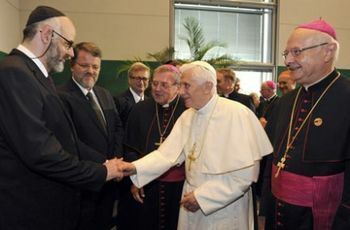 Nor should I omit to mention the historic meeting for Jewish-Christian dialogue that took place in March 2006 with the participation of Cardinal Walter Kasper. That cooperation is proving fruitful. Alongside these important initiatives, it seems to me that we Christians must also become increasingly aware of our own inner affinity with Judaism, to which you made reference. For Christians, there can be no rupture in salvation history. Salvation comes from the Jews (cf. Jn4:22). When Jesus' conflict with the Judaism of his time is superficially interpreted as a breach with the Old Covenant, it tends to be reduced to the idea of a liberation that mistakenly views the Torah merely as a slavish enactment of rituals and outward observances. Yet in actual fact, the Sermon on the Mount does not abolish the Mosaic Law, but reveals its hidden possibilities and allows more radical demands to emerge. It points us towards the deepest source of human action, the heart, where choices are made between what is pure and what is impure, where faith, hope and love blossom forth. The message of hope contained in the books of the Hebrew Bible and the Christian Old Testament has been appropriated and continued in different ways by Jews and Christians. "After centuries of antagonism, we now see it as our task to bring these two ways of rereading the biblical texts – the Christian way and the Jewish way – into dialogue with one another, if we are to understand God's will and his word aright" (Jesus of Nazareth. Part Two: From the Entrance into Jerusalem to the Resurrection, pp. 33f.). This dialogue should serve to strengthen our common hope in God in the midst of an increasingly secularized society. Without this hope, society loses its humanity.